There are countless stories spread across the 100,000 square feet of the American Treasure Tour. Some famous, some little known. 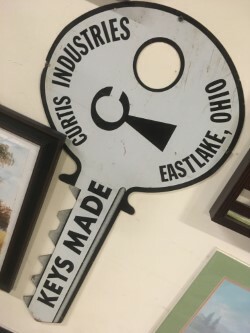 Today’s story is dedicated to a sign located just inside the doors of our Toy Box, something every visitor sees, although may not actually notice: a two-foot long key advertising Curtiss Industries of Eastlake, Ohio. They were established in 1932 by William Abrams and two of his sons – Morris and Howard – as the Clipper Key and Lock Company. When they joined forces with the inventor William Curtis in ’34 to invent a new key cutting machine, they changed the name of the company and unlocked a whole world of potential. By 1961, they had done so well for themselves in the lock and key, as well as the car part industries, that they built their factory complex in Eastlake, Ohio. However, their good fortune was not to last too long, unfortunately. After William and Morris’ deaths, the next generation of Morris’ sold their portions of Curtiss stock and the Ohio Forge and Machine Corporation bought them out, resulting in a feud that lasted for years. But in their heyday, the Eastlake plant had well over 100,000 square feet of air-conditioned space, where they produced enough for their over 80,000 customers. They had an army of 600 craftsmen, engineers, salesmen, and administrative personnel, with forty personnel dedicated solely to ensuring quality customer service.